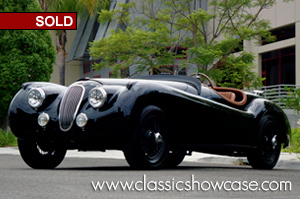 Born January 19th, 1954 this XK-120SE came originally clad in Birch Grey with a Red interior and French Grey top. Its very first caretaker was Bert Haitrey of New York City. The Special Equipment example includes: high lift camshafts to give the motor 180 horse power which is 20 more than the regular version, a stiffer suspension, wire wheels and a dual exhaust with customer headers. This very special roadster is nicknamed Top Cat and has been custom built for rallies and touring in mind yet keeping the dramatic sleek lines 120’s were well known for. The collector who commissioned the restoration build hails from the warm dry state of New Mexico. Dressed in glossy piano Black, and trimmed in a rich Tan, it has a custom made black tonneau with a zipper for the cockpit. The wire wheels were painted body color, while the knock offs remained chrome. The seating is two alloy bucket seats wrapped in supple Tan leather. The instrument panel is covered in black leather, and an alternate power source has been installed for use with a cell phone and auxiliary input. The battery was removed from behind the driver’s seat for more comfort while driving and the one behind the passenger seat was kept and increased the size for best operation. The rear bulkhead was modified to allow for the most legroom possible to accommodate the driver. The lines of the XK120 were of utmost importance, so many changes were made to extenuate them even further such as removal of the bumpers, the license plate surround fixture, and mirrors; the turn signal system was incorporated in with the parking light fixtures in the front, and in the brake lights the rear; it has the addition of amber fog lights, and we removed of the windshield. Two Brookland windscreens were installed with a custom fabricated cowl in front of the windscreens to cover the width of the cockpit, giving this beauty an unobstructed view. The convertible top was removed as well as the windshield wiper system. The front of the car was encased with a clear bra to protect it from any surface chips and dings, and there is a belt strap that goes across the bonnet to secure it well. It has a 1-inch smaller steering wheel with racing seatbelts, and a polished aluminum racing fuel fill. Under the bonnet it was converted to negative ground, had SU carbs rebuilt and installed, an upgraded shock kit used for the rear, it was converted to disc brakes all the way around with a brake booster, installed a upgraded master cylinder to accommodate the booster and disc brakes, gaiters were installed on the springs, a distributor with a Pertronix electric ignition built in was added as well as a high torque starter, alternator, a high output oil pump, and a screw on oil filter. A brand new 5 speed gearbox was fit to the car paired with hidden adjustable electric power steering to make the drive a lot more fun and easier for the driver. To accommodate all these add-ons a larger aluminum radiator with an auxiliary fan was installed to keep it all cool and running efficiently. Over the course of the last few years, Top Cat has participated in one JCNA concours, one local show, and two rallies. The rallies were the Colorado Grand “Into the Sun” rally, and the New Mexico “Rally du Soliel”. 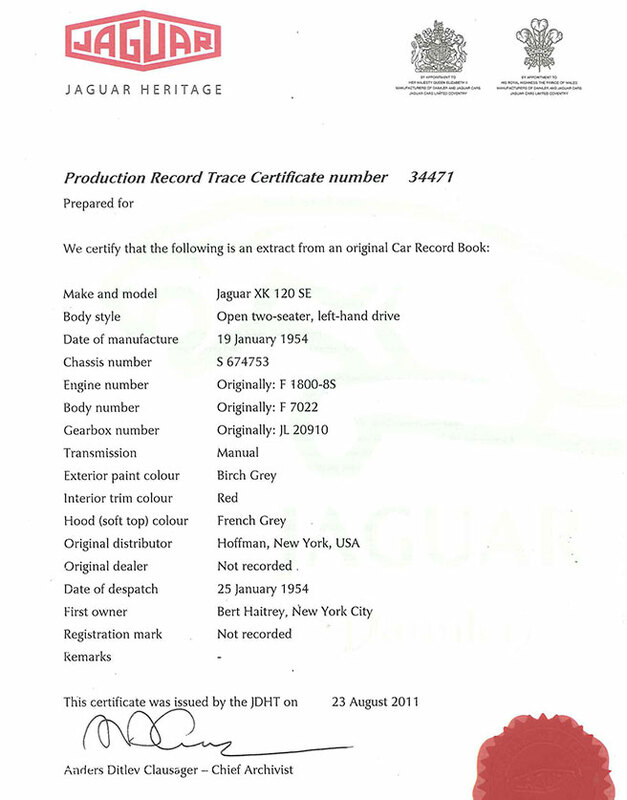 The last JCNA concours it attended in the fall of 2018, the International Jaguar Festival, it won 1st place in the modified class. It has been well sorted, has had its legs stretched, and the engine just broken in, it is now ready to go on to its next adventure with the perfect Jaguar collector who dreams of driving a true classic that will not only turn heads, but will excite their inner race car driver. Coming complete with its tools, jack, hammer, spare tire, and a MP4 video of the restoration process, this 120 is sure to please even the devoted Jaguar purist. While onlookers gawped in jaw-on-the-floor wonder as the Jaguar XK-120 made its show-stopping debut at the 1948 London Motor Show, there were skeptics who questioned the attainability of the speed implied by its name. Naysayers soon ate their words when in May 1949 an XK-120 with aero-screens and undertray averaged 132.6 MPH for the flying mile on the Jabbeke autoroute in Belgium. Why Belgium? There simply wasn’t a suitable road in England. With cars in standard trim capable of 120 MPH, the XK-120 was quite simply the world’s fastest production car, no argument. As for XK, that stands for the very advanced alloy-headed 6-cylinder twin-overhead-cam XK engine, which debuted in the XK-120 and endured until 1986. The space-frame competition version, the XK-120 C, better known as the C-type, won Le Mans in 1951 and 1953. Meanwhile, from 1951 road car drivers could opt for the higher-performance 180 HP SE—Special Equipment—with high-lift cam shafts, a lightened flywheel, C-type cylinder head, twin exhausts and wire wheels. Initially conceived as a low-run prestige showstopper, the XK-120 became a defining brand statement with 12,000 produced until 1954-85 percent of which went for export, with the vast majority of those to the U.S.—helping to secure Jaguar’s very future and sporting legacy.